Raleigh-Durham-Chapel Hill is the No. 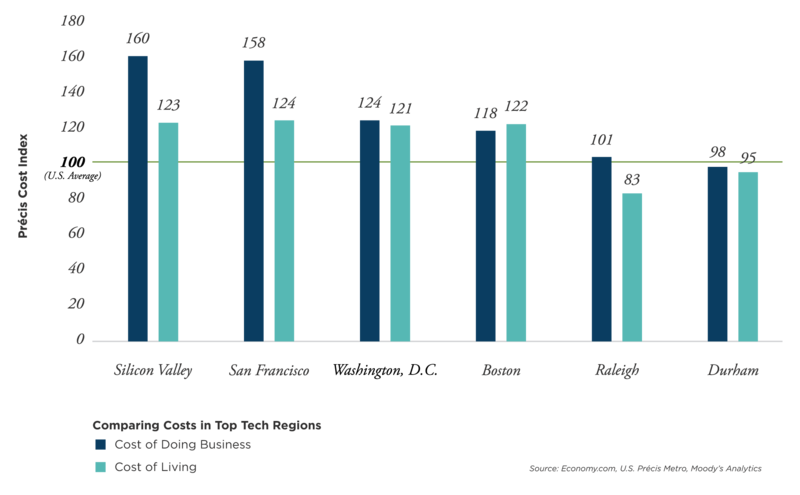 5 market for tech companies in the nation, according to a recently released study by real estate brokerage giant Cushman & Wakefield. Cushman & Wakefield’s Tech Cities 1.0 report reviewed tech growth in U.S. markets across the U.S. and highlights the Top 25 markets. These cities have outperformed the U.S. as a whole in terms of job growth, income growth, net absorption of office space and rent growth over the past seven years. The report weighs several components of “tech stew” ‒ including workforce talent, capital, growth opportunities and entrepreneurship. It analyzes, among other measures, the number of educational institutions, the percentage of tech and knowledge workers and the amount of venture capital funding in metro areas. 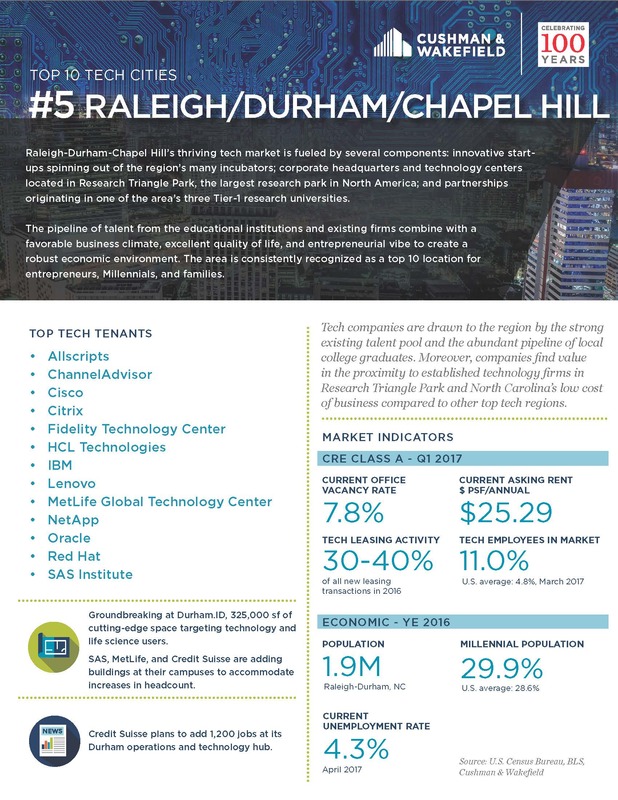 “Raleigh-Durham-Chapel Hill, often referred to as the ‘Triangle’…, has developed into a major market for technology companies given the area’s deep pool of skilled labor, the presence of three prominent universities, and its reputation as a medical and technology research hub,” said Rich Harris, managing principal, Cushman & Wakefield. The full list of top five finishers in the report includes: 1. San Jose, California (Silicon Valley); 2. San Francisco; 3. Washington, D.C.; 4. Boston/Cambridge in Massachusetts; and 5. Raleigh-Durham-Chapel Hill in North Carolina. Distinctive attributes of the Triangle cities, combined with the their high prevalence of PhDs, world-class researchers, talented engineers, techies, and entrepreneurs, make the region fertile ground for startups of all kinds, Harris said. The “live-work-play” concept – which emphasizes development that is compact, connected, walkable and multiuse – has “rapidly built up our city centers across the Triangle, particularly in downtown Durham where there was an abundance of historic tobacco warehouses that were converted to sleek tech workspaces with hardwood floors, big bay windows, large timbers, and high ceilings, ” Harris said. “Most of these buildouts were aided by historic tax credits, which enabled companies to create one-of-a-kind destination spaces for tech companies,” he added. For example, the asking rental price for Class A office space in Raleigh-Durham averages $25.29 per square foot vs. $71.60 in San Francisco, $64.43 in Washington, D.C., $57.26 in Boston, and $51.48 in San Jose/Silicon Valley, according to Cushman & Wakefield. Visit here to download the full report. The one-page overview below provides further details about the tech market in Raleigh-Durham-Chapel Hill.